Over the past few years I have given lectures to Jewish communities all over the United States and Canada. More often than not – particularly in the U.S. – these lectures have taken place in small cities and towns. And more often than not, the people who invited me to their communities did not work for major Jewish organizations. Instead they worked for small organizations — often tiny organizations – with no more than a handful of committed members. Yet working alone, they have arguably each done more to bring pro-Israel voices to their communities than the major Jewish organization combined. For instance, in 2007 I was invited to Detroit by the Zionist Organization of America's local office. That office was actually one person – a small businessman named Mark Segel who runs the ZOA office in his spare time. In 2008 I was invited to Fresno, California by the Republican Jewish Coalition. Last year the Fresno RJC amounted to two people – a frog farmer named Stuart Weil and an obstetrician named Linda Halderman. And this month an organization called the Committee for Truth and Justice brought me to Milwaukee. The group has two members – Ivan Lang and Nancy Weiss-McQuide. In all of these cases, the individuals who invited me organized every aspect of my visit. They not only ordered my tickets and raised money for my appearances, they solicited media interviews, meetings with local politicians and Jewish machers. They advertised my community lectures, and worked to guarantee high attendance. They approached both major and minor Jewish and non-Jewish organizations to seek co-sponsorship for the events and encouraged Jewish students from local universities to attend. In all these cases, inviting me to speak was not a one-time effort for the activists who brought me to their towns. I was just one of dozens of Jewish and non-Jewish pro-Israel, anti-jihadist speakers they have brought to their communities in recent years. These Jewish activists from around the U.S. receive no payment for their efforts. They also receive scant thanks from their fellow Jews for the work they do. When they have asked local offices of major American Jewish organizations like the Federation, the JCRCs or AIPAC to co-sponsor their events, more often than not their requests have been rejected or ignored. On the rare occasions where major Jewish groups have agreed to co-sponsor their events, that co-sponsorship has involved no significant financial support for their efforts. When I asked Segel of the Detroit ZOA why he works so hard, he explained that he does it for his son. He wants to make sure his child understands why Israel is a great country, and that there are things worth defending, no matter how hard it can be. Other activists have given similar responses, or just shrugged their shoulders as if to say, "Well, someone has to do it." There are two reasons why these stories ought to be of interest for American Jews. First, they show that individuals can make an enormous difference in their communities even when they operate outside the framework of the organized Jewish community. People like Segel, Halderman, Weil, Weiss-McQuide and Lang are consummate activists and natural leaders. They do not allow others to tell them what to do and whom to listen to. These men and women are part of a growing army of individual Jews throughout the U.S. who are moved to act by their conviction that Israel must be defended against the expanding alliance of the international Left and the forces of global jihad. They believe that by defending Israel they are also defending the U.S., whose national security is directly linked to Israel's ability to survive and prosper. Their willingness to devote their time and effort to the increasingly lonely task of defending Israel makes them all extraordinary Jews. And this brings us to the second reason that efforts by men and women like Weil, Segel, Halderman, Lang and Weiss-McQuide are noteworthy. All of these people and thousands of like-minded Jewish activists throughout the U.S. are moved to act by their sense that Israel and Israel's alliance with America are not being effectively defended by the organized Jewish community. Today Israel faces an existential threat from Iran's nuclear weapons program. This threat is exacerbated by the weakening of America's commitment to Israel's defense under the Obama administration. It is also made worse by the organized Jewish community's unwillingness to defend Israel from a hostile Democratic administration. The long-term trends impacting Israel's relations with American Jews are similarly bleak. The coming generation of American Jewish leaders has been indoctrinated at American universities to believe that Zionism is a form of racism rather than the national liberation movement of the Jewish people and one of the most successful and most justified revolutionary movements in human history. The Joseph Liebermans, Mort Zuckermans and Malcolm Hoenleins of tomorrow have been taught that Israel isn't worth defending. It is against this darkening backdrop, as Israel celebrates its 61st birthday this week, that the importance of the work of lone American Zionist activists must be celebrated. 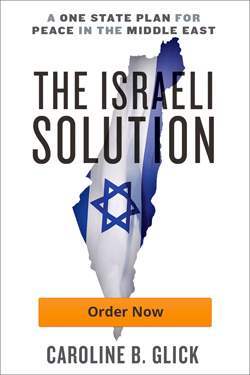 More likely than not, it will be due to the commitment of individual Jewish American activists like Segel, Weil, Halderman, Weiss-McQuide and Lang and small-time donors who support them – whether they operate within larger organizational frameworks or through personal websites, synagogues and small organizations – that American Jewry's support for Israel will be cultivated and maintained. And it will be due to their grass-roots community activism that new pro-Israel coalitions with likeminded non-Jewish Americans will be nurtured.